BOERUM HILL — There’s a certain je ne sais quoi about Smith Street. Neighborhoods surrounding the street will celebrate Bastille Day this weekend with food, drink, live music, a party for pups and the annual Pétanque tournament. Local residents and businesses have been celebrating the French national holiday for more than a decade, said Bette Stoltz, director of the South Brooklyn Local Development Corporation. Bastille Day, known as la fête nationale, marks the anniversary of the storming of the Bastille, a French prison, on July 14, 1789 and the beginning of the French Revolution. Stoltz has been organizing an annual street fair for the holiday for 12 years — and it’s only gotten “bigger and better,” she said. “It’s about half… French people from all over the city and [half] neighborhood people who just love to party with the French,” Stoltz said. The celebrations have been bolstered by a steady stream of French-speaking residents moving into south Brooklyn neighborhoods like Carroll Gardens and opening restaurants, shops and a local art gallery within the area. Many, including Stoltz, credit the influx to a popular French dual language program that was introduced at P.S. 58 in 2007. “You hear French spoken in the streets a lot,” she said. 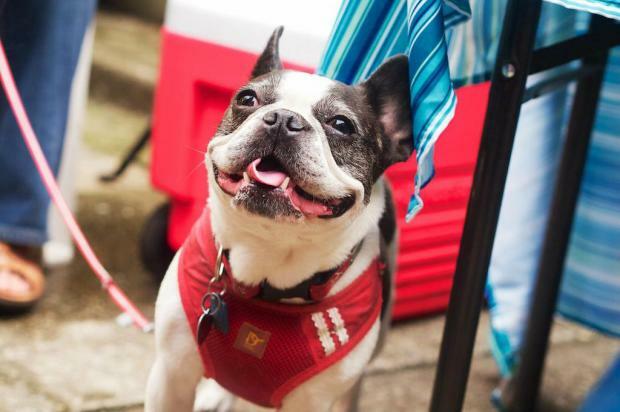 By Brooklyn, a fine goods shop at 261 Smith St., will pamper the neighborhoods’ pups with a “French Bulldog Party” on July 12 from 3-5 p.m. The store first hosted the party in 2012 and decided to make it an annual event in collaboration with Bastille Day. “Bastille Day is such a huge party and event on Smith Street,” said Mindy Dulberg, the shop’s manager. Pooches of all breeds are welcome to join the party, where treats for dogs and humans will be served. Local businesses like Stinky Bklyn, Smith and Vine, One Girl Cookies and Zombie Hut and Dassara will be serving snacks as well as a cocktail with a lemon syrup from Morris Kitchen. Last year, By Brooklyn donated $600 to Badass Brooklyn Animal Rescue. This weekend's party will benefit Brooklyn Animal Action. Entry is priced at $5 with a dog and $10 without a dog. Smith Street will transform into 16 sandy courts for the annual Pétanque tournament, a bocce-like game that’s played with three metal balls and a smaller wooden ball. More than 60 teams will participate in this year’s competition. Another tradition of the event is the arrival of the Quadrozzi Concrete truck that provides mounds of sand for the courts. A street fair will begin from about noon onwards. Restaurants like Bar Tabac, White Oak, Char No. 4, Kittery, Union Grounds, Bar San Miguel, Bien Cuit, Pane e Vino, One Girl Cookies, Britain Indian Restaurant and Les Bretons will be offering snacks and libations between Bergen and Pacific streets. The World Cup final match between Germany and Argentina will also be screened live during the celebration near Smith and Dean streets.